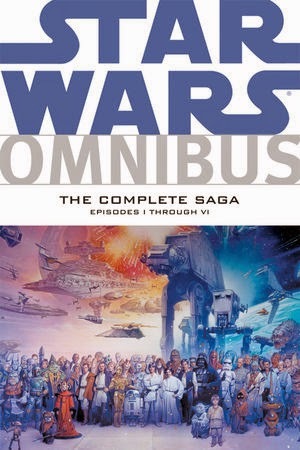 Last week I started my review of Star Wars Omnibus: The Complete Saga published by Dark Horse comics. It includes the comic book adaptation of the first six Star Wars movies. The first part of the review focused on Episodes IV, V and VI. All three adaptations were originally published in single issue format by Marvel Comics a few decades ago. The actual stories included in this collection were reissues by Dark Horse to coincide with the release of the Star Wars: Special Edition DVDs. The second part of review will focus on the adaptations to the prequel trilogy. It’s been interesting to read the adaptations, mostly to experience how certain scenes from the movie are better suited to being adapted to comic form. Many scenes in The Phantom Menace are made up of people talking. As such, it’s rather simple to do a talking head comic. It’s a slower read than you would thing but there is a lot of dialogue in the movie and most of it is present in the comic. In comparison, most of the action sequences are cut short considerably. The pod racing scene takes place in just a handful of pages. Specifically, the entire race only takes up five pages! It’s not just the race though; all the action scenes are cut down to allow for all of the dialogue heavy scenes. It makes sense why the creative team decided to do so. Action takes more space to reproduce in comics than it would in a movie and while you could have rewritten all of the diplomatic and senatorial debates, it would have made for a less faithful adaptation and it’s a lot of work for little pay off. Yes, you’d then have more room for the action scenes but you wouldn’t be able to convey the same sense of spectacle and speed as the movie could. As such, the lightsaber duels, the battle on the plains of Naboo, the pod racing and the starfighter battle above Naboo all flounder and aren’t particularly interesting to read. Perhaps unsurprisingly, most of the things I don’t like about the movie I also don’t like in the comic. Things like how the Gungans, particularly Jar-Jar Binks who has more “panel time” than any of the other Gungans, are super annoying. In the films you hear how they talk like idiots even if you’re not paying attention to them but it’s an entirely different thing to see their dialogue written out and then reading it. It magnifies the stupidity of their speech tenfold. Shut up and listen to Yoda ya little brat! The art is serviceable. It does what it’s supposed to do but the characters all look stiff, possibly because the artist is using the film as photo reference. The actors rarely look like themselves but that’s fine. As much as I like the thought of reading a comic starring Liam Neeson, there is no real need to have the characters look exactly like the actors who portrayed them in the film. What’s more troublesome is that most of the male characters look alike and many characters have a piggish nose. It’s kind of distracting to see similar facial characteristics on so many characters. Still, Damaggio gets the job done and I can’t really fault him for that. It’s just disappointing that Artoo and some of the starships are better drawn than most of the human characters. The art by Jan Duursema, who’s done quite a bit of Star Wars work in comics, is better than the art for Episode I. It’s very dark though, she uses a lot of inks and sometimes it’s too much. I appreciate how she embellished her art and avoided trying to simply draw screen captures of the film. She also changes the composition or a few scenes, giving us a different camera view than what we’re used to seeing. 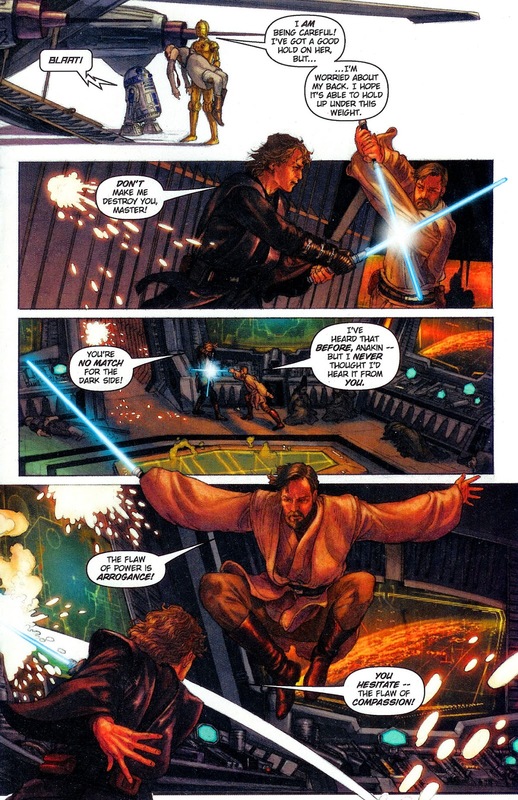 Henry Gilroy scripted the adaptation for The Phantom Menace and Attack of the Clones but they’re both rather different comics. I’m certain that a lot of the differences have to do with the differences between both movies. While The Phantom Menace had a lot of dialogue with a few action sequences spread throughout the movie, Attack of the Clones has the same two types of sequences but the balance has shifted. There is more action and less dialogue and that has an impact on the adaptation. Similarly to the scripters for the adaptation of the original trilogy, Gilroy uses narration to help reduce the length of the action scenes. The battles on Geonosis, Obi-Wan and Jango Fett’s fight on Kamino, the lightsaber duel against Count Dooku, all of the action scenes use narration in some capacity. It works well because the action doesn’t feel as breezy and unimportant as they did in the adaptation of Episode I. These action scenes matter and the narration helps to slow it down and provide the reader with important, and sometimes even interesting, details. In every way, the adaptation for Attack of the Clones is better than the adaptation of The Phantom Menace. There is a noticeable improvement in storytelling and the result is a more enjoyable comic but it still fails to deliver as much impact as the movie. Yoda dude, don't hold that lightsaber so close to your face. It's drying our your skin. 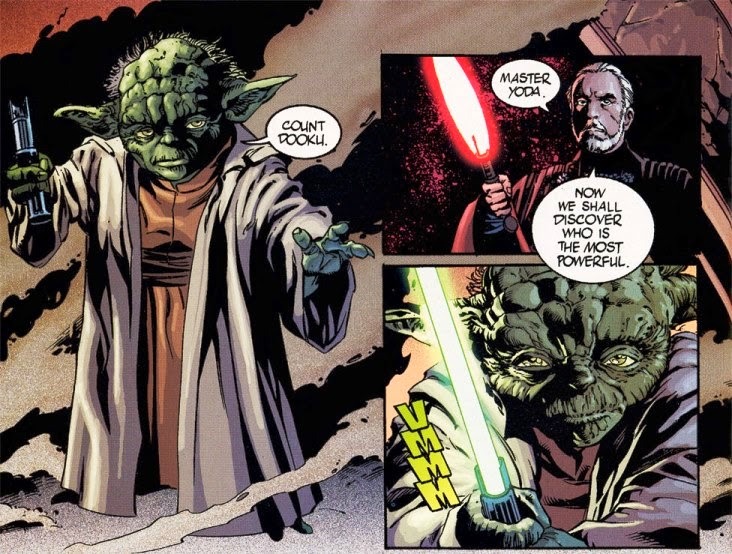 After reading the comic book adaptation of Episode III, I’m very glad I decided to read these stories in the order in which the films were released because Revenge of the Sith is the best of all six adaptations by a considerable margin. It makes for a good way to end this trip through the comic book adaptations of the saga. It’s pretty simple to see why this is a better adaptation than the others. For starters, it flows well. There are very few weird cuts or transitions from one scene to another. It doesn’t read like it’s adapting anything. To the contrary, it reads like an original comic story, the elements from the first half of the story progressively build to the elements of the second half and even though it’s titled Episode III, the end is quite satisfying. It also helps that like the story in the adaptation of A New Hope, this story focuses quite clearly on one main character and those closest to him. It’s Anakin’s story, everybody else is supporting that story. 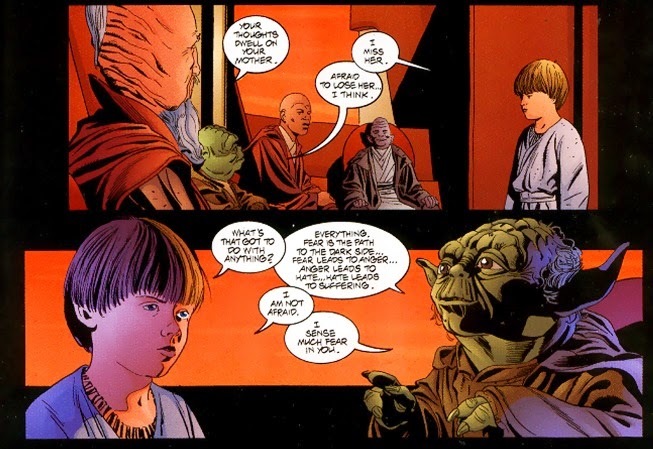 The story is tight, even when characters go off to do their own thing; it ties it to what’s happening to Anakin. That consistency in the story certainly helped with how well it could be adapted to another medium. Naturally, some of the scenes in the movie are cut short, particularly the action sequences. I don’t mind because it actually helps to accentuate the focus on Anakin. Besides, the scenes are all there, They’re all here, the rescue of Chancellor Palpatine, the duel between Obi-Wan and General Grievous on Utapau, Yoda helping the Wookiees on Kashyyyk, the duel with the Sith Lord, Order 66 and of course the climactic battle between Anakin and Obi-Wan. They’re all shorter, yes, but those condensed sequences are well balanced by more dialogue heavy scenes which serve the purpose of plot and character development. The art is also the best of any of the adaptations. It has a painted quality that increases the sense of realism without relying on a heavy use of crosshatchings. The colouring palette is also less bright than the colouring for the adaptations of the previous episodes. It helps to reinforce the thematic elements of Anakin’s journey to the dark side as well as avoid the cartoonish look of some of the scenes in Episode I. If you want to read a comic adaptation of the Star Wars film, do yourself a favour and start with this one. You won’t be disappointed with is like you would be if you read any of the other adaptations. Really, the most interesting thing about reading this collection was seeing how different creative teams adapted the movies. Some were very success, others considerably less so.